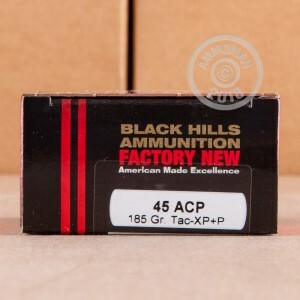 Consider using this Black Hills +P hollow point ammunition as your carry load. 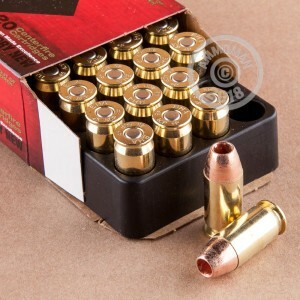 Each of these 20 cartridges fire a 185 grain Barnes TAC-XP solid copper hollow point bullet. This ammo is a great self-defense load for in-home protection or concealed carry. 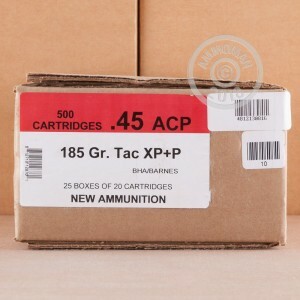 The TAC-XP fires a relatively light projectile at a high muzzle velocity of 1,000 feet per second. Although packed with a +P load, the reduced projectile weight gives the round a less severe recoil profile. Black Hills uses non-corrosive Boxer primers and reloadable brass cases. They are a well respected manufacturer that serves law enforcement agencies across the country as well as every branch of the US Military.